And a beautifully painted fire hydrant it is! What! No Awesome mailboxes? Look at the face! The hydrant is painted like a little folk doll/person! 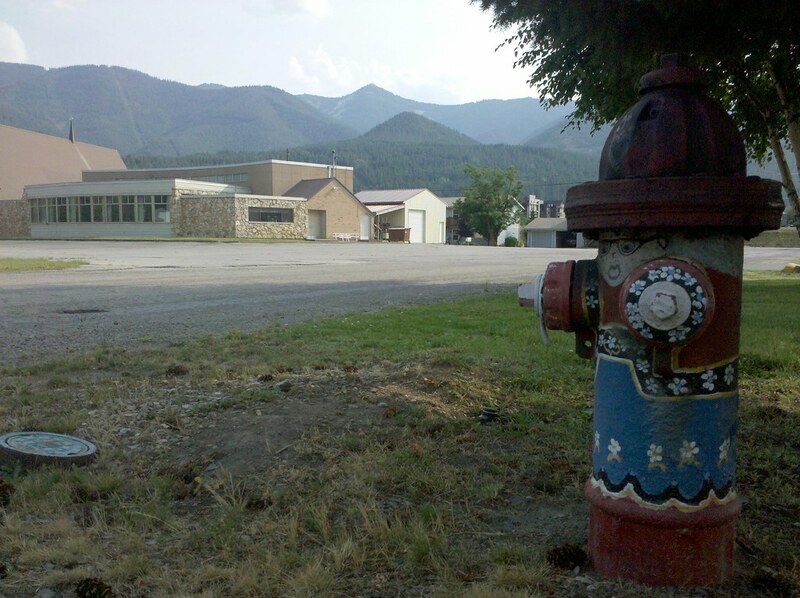 I like that — we should do that to all fire hydrants as a nationwide beautification project. What is that building. Looks like 50s/60s architecture. Is it a church or a school? kinda looks like a church with a school attached to it Candice…. who knows?? Just found your site yesterday and have now read through it all (not all comments though!!). What a fantastic journey and what wonderful people. As an Australian, it has opened my eyes to the US, moreso than what we see on TV. 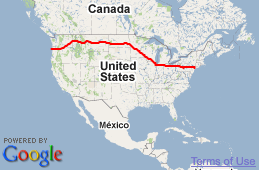 I was indifferent about visiting, but now I’d love to travel around the States. Well done on your journey and look forward to reading more each day. What an inspiration you and your countrymen are! Welcome to the Hobo Planet Margaret! oh you have to go back and read all the comments…please….you will realy get to know us all. Oh no, don’t do it, Margaret! It will make you cross-eyed, especially since some of the pictures have over 100 comments. Just keep up from now on. *L* We call ouselves, collectively, the Hobo Planet. So welcome! Awesome view of the mountains! Who knew fire hydrants needed glasses???? Love the idea of this… very sweet! This sort of looks like one of those nesting dolls. How cute! I deem this Neato Fire Hydrant #1. Matryoshka dolls! I love painted fire hydrants. AND CARS!!! Anyone from a 300-400 mile radius of this town has heard of the infamous DAVE SMITH MOTORS and can’t help but to say LOW LOW LOW prices at least 16 times while passing through it! A R T = A Real Treat! Love that they were allowed to “dress up” their fire hydrants. How adorable. What a way to FIRE UP the hydrants. Hope they keep her and the flowers well hydrated! What a great idea for an Eagle Scout project, Even to do a few!